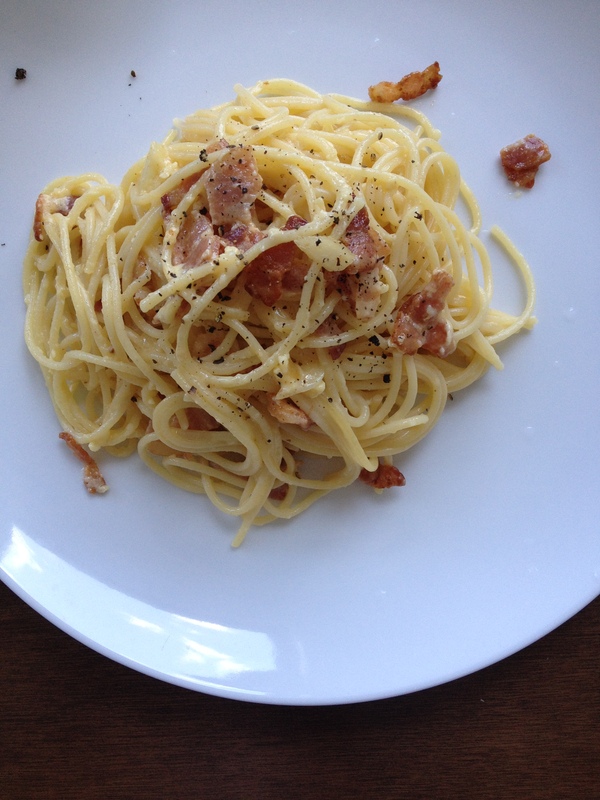 Classic spaghetti carbonara: one of my absolute favourites. You can’t go wrong with bacon & cheese, and it’s also quick to make. Tops 45 minutes for prep and cooking maybe? What do you think? A quick internet search suggests that the conventions are pretty much set: we need spaghetti, bacon, garlic, olive oil, parmesan cheese, egg, black pepper, and salt. I cheat a bit and add a little whole milk to the egg + cheese mixture, but that’s about it. I don’t remember which recipe I referred to initially but usually use 1 large egg to about 0.5 cup of Parmesan cheese, with extra for serving, for 2 big portions. 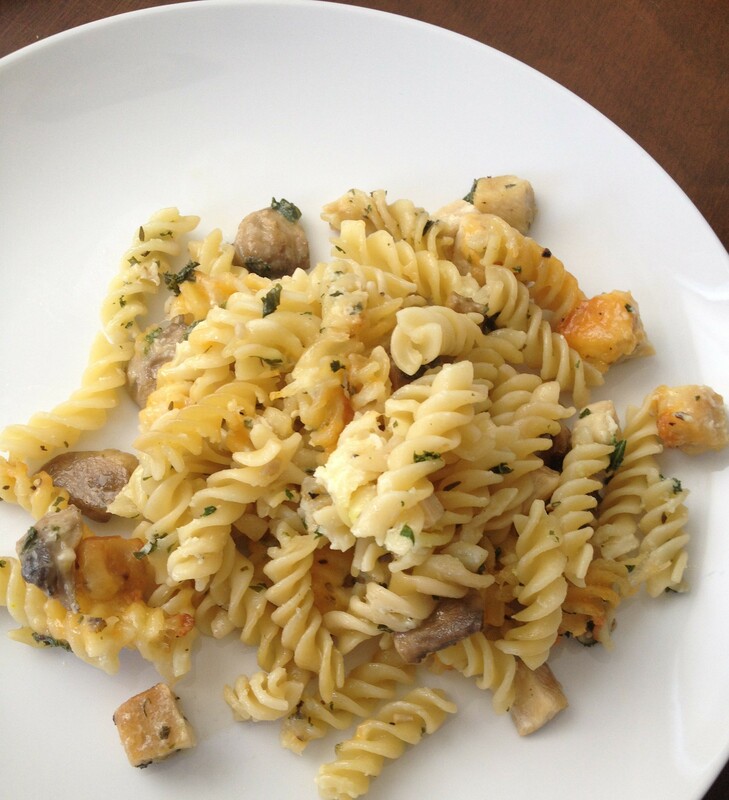 Do use a good quality cheese and make sure you save a little of the hot pasta water for the sauce. The only downside to carbonara is that you can’t really keep leftovers, but I guess W and I generally don’t have a problem cleaning off our plates when it comes to pasta :D.
This pasta gratin is something that I had in my head to create for a long time, and I finally did it! The combination of mushroom, chicken, and kale turned out really well. The kale in particular was a great addition because the green gave the dish extra colour, in the way that parsley would, but it tasted better than parsley. The sauce is just a basic bechamel (white sauce). I think of my mom whenever I cook this kind of sauce because it was she who first taught me how to make it for a tuna macaroni bake one afternoon when I was back home for the summer. I treasure that memory deeply, and I think it’s because we naturally cling to memories of our parents teaching us how to do something new. The bechamel recipe I learned from Mom is most probably from the 12th edition of the Fannie Farmer cookbook, which was a culinary bible if you will for many home cooks throughout the 20th century—Wikipedia tells me it was first published in 1896! Bechamel makes for a simple base for any white sauce you’ll ever need to make. Add herbs like thyme or rosemary or nutmeg, or minced garlic and onion, to give it extra flavour. 1. Cook pasta as per package instructions. Tip into an oven-safe 8×13 dish or equivalent. 2. Pre-heat oven to 400 degrees Fahrenheit (about 205 Celsius). 3. Bechamel sauce: in a small saucepan, melt butter over low heat. Gradually add in flour, mixing it in thoroughly. When flour is well incorporated with butter, add milk. Heat to boil, then simmer while stirring thoroughly. Add salt and black pepper to taste. Set aside. 4. Heat olive oil on medium heat in skillet. Pan fry chicken, leaving to brown on one side before flipping. 5. When chicken is thoroughly cooked, remove from pan. Add extra olive if needed, then cook garlic and mushrooms together until fragrant. Mix in kale last and cook until soft. 6. 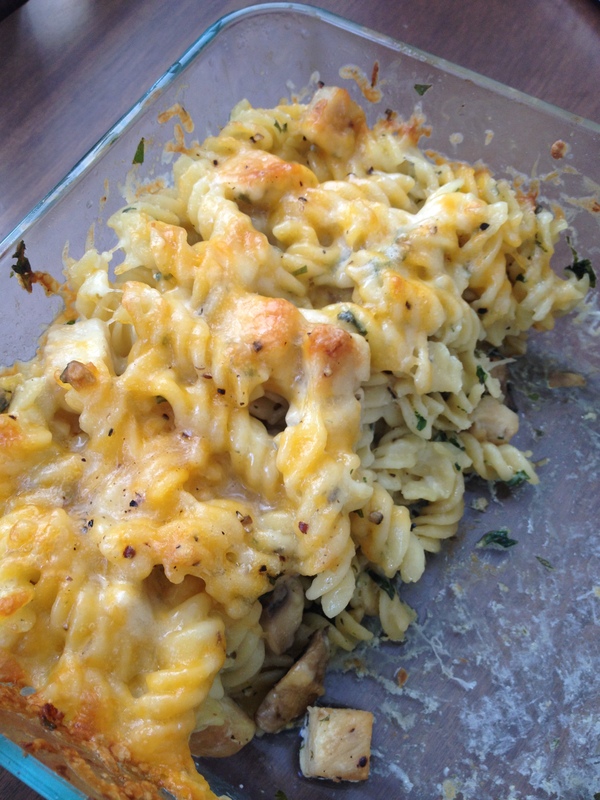 Mix in chicken, mushroom, kale mixture with pasta in oven-safe dish ready for baking. Pour in bechamel sauce and stir to mix. 7. Top pasta with cheese and extra black pepper. 8. Bake until cheese is nicely colored, at least 20 minutes. 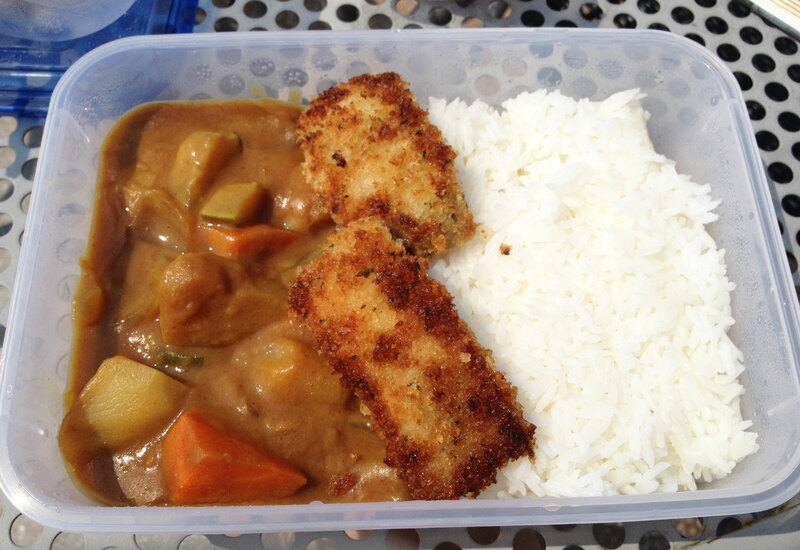 Japanese Curry is another favourite dish of mine because it is easy to cook and freeze, budget friendly, and scrumptious. I use the medium hot curry roux cubes from Vermont Curry and pan fry some kind of protein to go with it (beef, pork, chicken, even tofu). This version is with pork cutlets—hope you enjoy! 1. Dice vegetables into bite-sized pieces. 2. Set up separate dishes for the egg wash, the cornflour, and the panko. 3. Heat wok with 1 tablespoon vegetable oil on medium heat. Cook onions and carrots until fragrant. Then add potato and zucchini, cook for about 2-5 minutes. 4. As the vegetables are slowly cooking, prepare the pork cutlets. Marinate with salt and black pepper. Rub each piece with a thin layer of cornflour, then dip in egg wash, and then finally cover in panko. 5. When vegetables have softened, add 3.5 cups of water to wok and boil. After water has reached boil, lower heat so that mixture is just simmering and cover wok with lid. 6. Heat separate fry pan with 1.5 tablespoons of oil on medium heat. Fry pork cutlets by cooking on each side until nicely brown (about 5 minutes each side), then flip over. Add extra oil once you flip the cutlets so that both sides brown properly—the panko will char otherwise. 7. As cutlets are cooking, check on vegetables. When the potatoes are cooked through, stir in curry roux to the mixture. Optional—add Worcestershire sauce and honey for extra flavour. Simmer for another minute and then switch off heat, cover. 8. 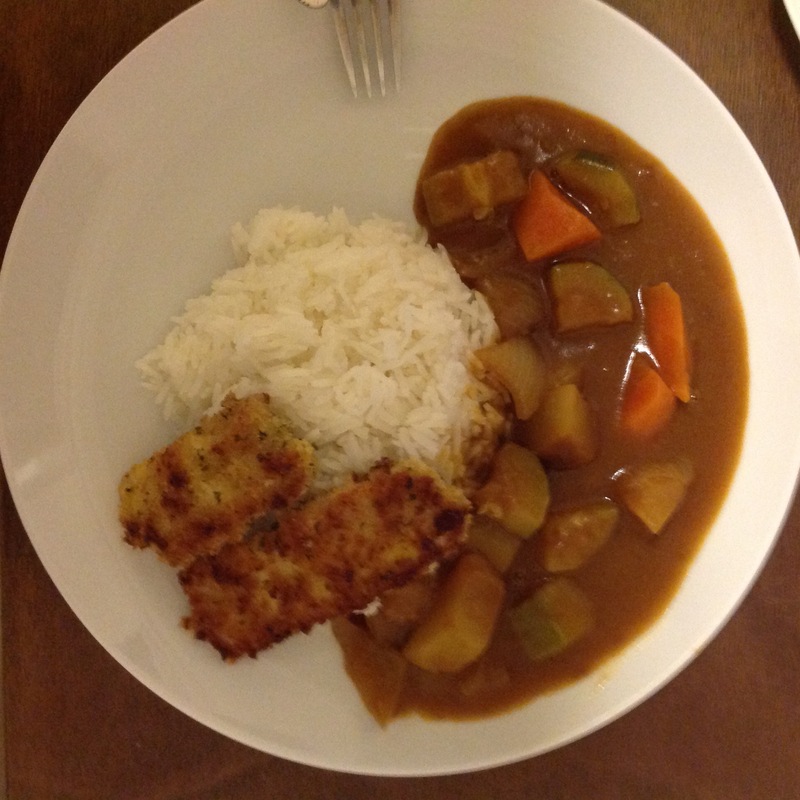 Serve pork cutlets with curry and short grain rice.